Ken Russell was one of the most controversial, celebrated, and maligned filmmakers from the 1960’s through the 1990’s. His psychological approach to narrative, expertly forged characterizations, transcendent fusion of the highbrow and lowbrow, and fearless transference of the avant-garde into Hollywood cinema made him invincible against his critics and impossible to ignore among motion picture academies. His second feature, an adaptation of D.H. Lawrence’sWomen in Love won several awards, and gave him carte blanche to endeavor a complex versatility that would rival even Stanley Kubrick, albeit on a heavy dose of LSD. This week the cinema features four unique specimens of his canon: The Boy Friend, a Busby Berkley style musical; The Devils, a Dark Ages history of seduction and demonic possession;Altered States, a science fiction thriller; and The Who’s Tommy, a rock opera of psychedelic hyper-Wagnerian proportion. Ken Russell’s earliest creative ambition was to study ballet before he decided to join the military. His penchant for the muse of dance, particularly with the style of Isadora Duncan, continued to inform his earliest works. The Boyfriend ensued as a visual triumph, composed of a myriad of dream vignettes of the most audacious design and choreographic imagery. Each dance sequence’s enormity of kaleidoscopic formation and lavish costume are truly on par with the works of Berkeley to whom they pay homage, but infused with the psychedelic aura of the early 1970’s. 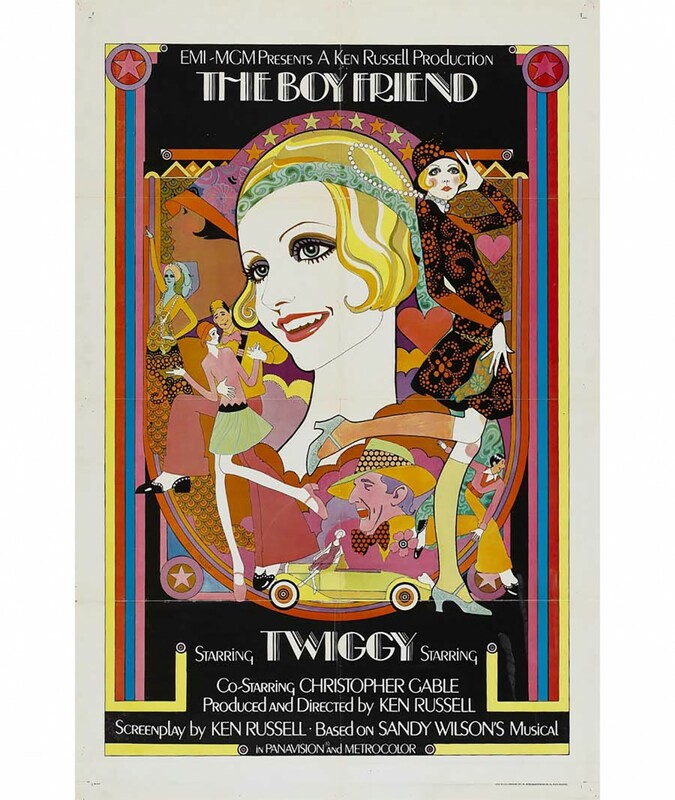 The Boy Friend earned original supermodel Twiggy two Golden Globe Awards, one for Best Actress and a second for Best Newcomer. The Devils is a dramatic reimagining of Aldous Huxley’s historic The Devils of Loudon, the true story of the handsome Abbé Urbain Grandier whose arrival among a conclave of nuns rouses upheavals of lust and hysteria. The story examines the medieval manner of conflating carnal desire with the supernatural machinations of demons and witches; with Oliver Reed as the condemned Grandier and Vanessa Redgrave as the hunchback Mother Superior struggling violently to repress the sensual urges taking form as demonic possession. The film was Russell’s most controversial for its violent sexual and religious content. It was banned in several countries and would only be distributed by Warner Brothers after severe cutting-room butchery. But Russell’s execution is superb in its spiritual delusions and psychological distortions – heightened by the scenic designs by a young Derek Jarman, who would later become a paragon of experimental cinema. Altered States is Russell’s most acclaimed film, peculiarly without any sacrifice made to the filmmaker’s bizarre arena of subject matter and stylization. Far from the garish color palates of Russell’s accustomed domain, however, the film is set in the forbidding laboratories of scientific academia. These terrestrial confines are not transcended by traditional science fiction projections of outer space travel – but by immersion into the interior realms of the psyche, with all its microcosmic mysteries illustrated in Dali-esque dreamscapes. William Hurt plays the role of Dr. William Jessup, a scientist whose shamanic experiments with Ayahuasca inspire an obsession with sensory deprivation tanks. The plot spirals into a thriller when the atavistic reach of his experiments plummet to bestial depths. The film served as the big screen debut of William Hurt as well as that of Drew Barrymore. The most expansive cinematic achievement of Ken Russell would have to be his adaptation of The Who’s concept-album rock opera Tommy, a film whose magnitude can only be conveyed first hand. With a budget of only $5 million, the film exponentially shatters the intensity of any blockbuster (which it turned out to be, at a box office gross of $35 million). The cast includes the Roger Daltrey, Pete Townshend, Keith Moon, Tina Turner, Jack Nicholson, Elton John, Oliver Reed, and Ann-Margret – who won a Golden Globe and an Oscar nomination for her performance. The story of a boy turned blind, deaf and dumb by the traumas of his childhood and his rise to messianic stardom as Pinball Wizard is hurtled in unmitigated psychedelic force. Tommy is an over the top masterpiece of harrowing depth and flooring entertainment value that begs the experience of a large screen viewing. In the 1980’s Ken Russell was scheduled to direct the film adaptation of Evita but the project was shelved due to casting disputes. In 1997 the film dissolved into the hands of Alan Parker and starred Madonna in a product forgettable, if barely digestible. Before his passing in 2011, Russell was in preparation to direct an adaptation of Alice in Wonderland, again falling to a disappointing rendering. Ken Russell was an asset to cinema as filmmaker of remarkable depth, a reverence for beauty, and an imagination that continues to addle the senses. Be sure to catch a screening this week in honor of his offbeat, invaluable legacy. The Boyfriend screens this Saturday, February 25th at 4:30pm.